Everybody loves desserts and no matter where in the world you are, a perfect meal will almost always end with sweets. Filipinos, who are generally in love with food, are known to have a sweet spot for well, sweet things: cakes, pastries, refreshments, etc. When in the Philippines, a traveler must never miss trying out the local cuisine and that includes the sweets, of course! 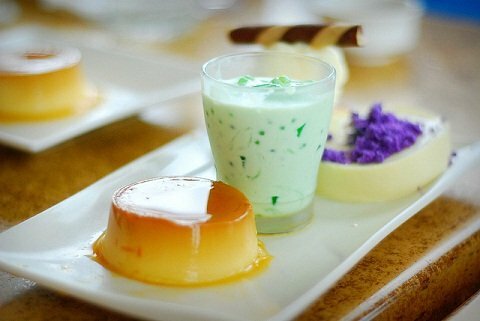 A Philippines getaway is never quite complete without sampling the delicious Filipino desserts. This post will give you an idea what some of them are. Have them as dessert or enjoy them ala carte; either way, you’ll surely enjoy the experience. This is perhaps the all-time top pick of all Filipino desserts. Leche flan is never absent during special occasions like fiestas, birthdays, even weddings! Who wouldn’t want to sink their teeth into the soft, creamy goodness of leche flan? Watch out though because while it may not be too sweet, this Filipino dessert can make your calorie count sky-rocket. It is, after all, made of egg yolks, milk and sugar. Where to find them: Leche flan can be found almost in every Filipino restaurant, mall fast food stalls and pastry shops. We like Goldilocks Leche Flan, not too sweet but creamy just the same. Before you skip this item and head on to the next one, know that ‘dirty’ is just a term. Maybe it is called that because of the way it’s sold on the streets: in a cart pushed by “Mamang Sorbetero”. 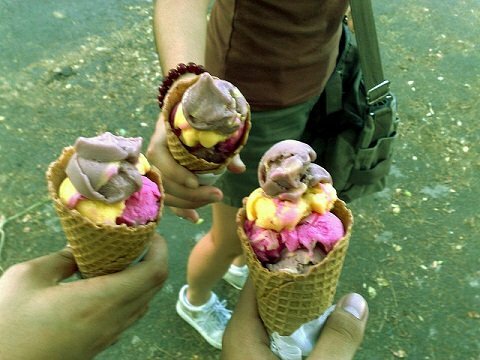 Dirty ice cream is more formally known as sorbets. Instead of milk, this ice cream is mixed with coconut milk which gives it a unique taste. They come in different flavors and colors too! Where to find them: When roaming around the streets of Manila (or any other city for that matter), watch out for the ringing of a bell. Vendors usually use bells to call out to customers. Some serve them on cones while others have them on sticks. If you’d like something not off from the streets, you can buy some in vacuum-packed tubs from Nestle and Selecta. Fans of mangoes will certainly love this Filipino dessert which is not only delicious but also very easy to prepare. Resembling the Italian favorite tiramisu, mango float is a layered ref cake made of crushed grahams, graham crackers, mango strips and lots of cream. Some even add a little milk to make it even more delicious. Much like the leche flan, mango float must be consumed in moderation. 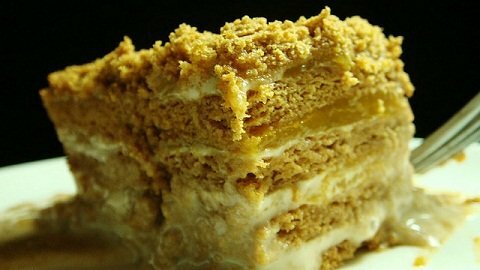 Where to find them: You can find mango float served in most Filipino restaurants. If you’d like to prepare your own, just layer the ingredients in the following order: graham crackers, cream, mango strips, and repeat the process until you reach the desired thickness. You can them top the layers with crushed grahams and mango balls. For best results, make sure to use fresh, ripe mangoes. This may have been named such because it definitely does not have any rival in goodness. 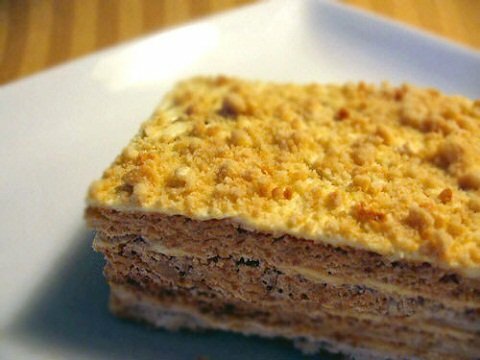 It is also a layered dessert but it is not that easy to prepare. Therefore, it is best to just scour the city you are in for the best Sans Rival. The scouring effort will be rewarded by the succulent layers of crispy meringue, butter cream and sprinkled all over with nuts, often cashew or pistachio. Some variations come in mocha and even durian flavors. Sans rival is perfect with coffee. Where to find them: Most home bakeries and pastry shops sell their versions of sans rival. Some of the best in Manila would be Sugarhouse (Greenhills Shopping Center), Betty’s Sans Rival (Quezon City) and Gay Vasquez’ Sans Rival (Pasig City). In Davao City, nothing beats Lachi’s Sans Rival, ATBP. Buko (young coconut) is a favorite tropical treat especially during the hot summer days but it also makes for a great dessert for anytime of the year. Buko salad is a heavenly mixture of coconut meat strips, nata de coco (coconut jelly), sweet kaong (sugar palm fruit), milk and cream. Some add cheese to added flavor and texture. Buko salad is best served chilled but when frozen, it feels and tastes like ice cream with lots of solid, often crunchy stuff. You might even say it’s the Filipino version of the rocky road ice cream. Where to find them: A lot of restaurants in beach destinations serve buko salad but it’s also not uncommon to find them in cities. They’re most likely to be served during family gatherings and fiestas. Maja blanca is also a very popular after-meal treat for most Filipinos. Its name sounds very feminine and fittingly so because maja blanca is a delicate dessert. It is basically a coconut pudding which almost has the same consistency of jelly. Maja blanca is usually creamy white and topped with roasted nuts. It is a favorite during family occasions especially during the Christmas season. You can download Philippine Traveler’s Christmas in the Philippines ebook for the recipe and so much more! Where to find them: You can try some Filipino restaurants or ask your local host to make some for you. 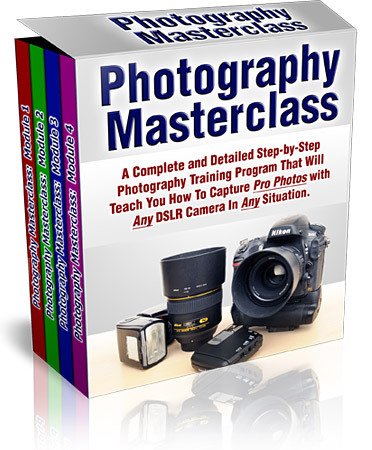 As mentioned above, you can also use the easy-to-follow recipe in the ebook. 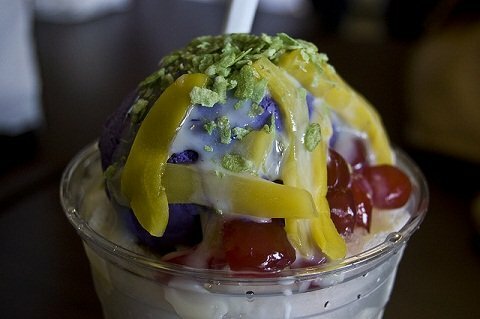 Halo-halo (literally, mixed-in) is a delicious mixture of tropical ingredients, crushed ice, milk and ice cream. The special kind also has a slice or two of leche flan. Halo-halo is a favorite heat buster during the summer months but a lot of people also love them even during rainy season. There is such a thing as ginataang halo-halo (halo-halo in coconut milk), a warm version which has pretty much the same ingredients except the crushed ice and ice cream. Where to find them: The streets of the Philippines littered with stalls, restaurants and cafes that serve this popular Filipino dessert. Some serve their own quirky versions while others follow the traditional recipe. Others still allow you to have your halo-halo custom-made with your preferred ingredients. Have something to add to this list? Drop us a line in the Comments box below. Liked this post? Share them with your dessert-loving friends!